I thought this book was cute and funny, even though I am not a teacher! It reminded me that teachers are people too, as so often students forget just as kids forget that their parents were once young. I love that I can pick this book up anytime and read a short story to cheer me up or make me laugh. The stories are from both new and experienced teachers so you get to see both ends of the spectrum. It also covers good and bad kids, funny and embarrassing moments, and stories of bonding. Not all of the stories are funny at first, but they do make you smile and are inspirational. One of my favorite stories is called “The White Car,” and is about a teacher who accidently hit a 9 year old boy who later ended up in her high school classroom! (They joked and bonded that year.) I think this book would make an especially great gift for any teacher, but then again I enjoyed it as a mom! BUY IT: You can find Chicken Soup for the Soul: at your local bookstore or at Amazon . You can also check out the Chicken Soup for the Soul website for more information and you can even submit your own stories there! 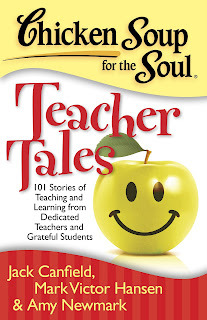 GIVEAWAY: Three winners will receive the book "Chicken Soup for the Soul: Teacher Tales"
This sounds like a fantastic book! I am a former teacher, currently a stay at home mom, and the Chicken Soup series have been so great for me!! I would love to be put in your drawing! This would be such a wonderful book! I Chicken Soup books! So uplifting!